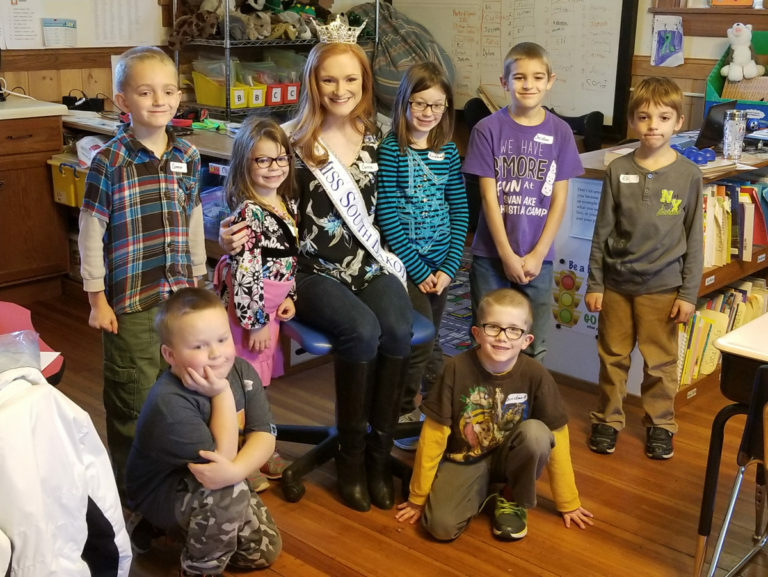 The relationship between Carrie Wintle, Miss SD 2018, and the Freeman Academy 1-3 students began last school year. Wintle, an accounting graduate of USD and Vanderbilt University, contacted schools across South Dakota and offered to donate a copy of her book, Mr. Money Sheep. Carrie decided to use the experiences from her youth of raising sheep and participating in 4-H, to write a book focused on teaching elementary students about the basics of money management. Freeman Academy 1-3 students used the financial principles they learned from the book alongside their aluminum can recycling project which has provided income for two school years. Learning to budget their income helped the students donate funds to the upcoming Salem Nursing Home building project. Another school–community connection related to Wintle’s book donation, is the sponsorship to the Mr. Money Sheep foundation from two local Freeman banks: Merchant’s State Bank and Great Western Bank. 7. Played the piano piece that she used for the talent competition during her involvement in Miss America 2018.